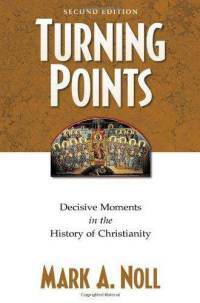 One of the books I’ve engaged with a bit to learn more about church history is Mark Noll’s Turning Points: Decisive Moments in the History of Christianity (Baker Academic, 1997, 2000 [2nd ed.]). I’ve started with his chapter on the crowning of Charlemagne in 800 because I’ve always found the first half of the medieval period fascinating because I know so little about it – it seems to me like overall the most neglected large portion of church history. I wonder what it would have been like to have been a Christian in Nothern Europe in 750 AD? What were the hot issues in the church in 900 AD? If Kevin DeYoung were blogging back then, what would be the prevailing currents of thought in the church he would be diagnosing and evaluating? There’s a whole world back there to which we often have no conscious connection. Noll argues that the crowning of Charlemagne was symbolically important in that it represented a number of other larger developments in the church in this era – the rise of the power of Papacy, the North-West geographical trajectory of the church, and the growing connection between church and state. The expansion of Islam into the Eastern Mediterranean region and the growing divide between the Eastern and Western churches, according to Noll, had both contributed to these developments, pushing the church further into Europe, and compelling the church to form new alliances and new authority structures. The church-state connection and the rise of the papacy were products of earlier developments (especially Constantine’s conversion and the capable leadership of Gregory the Great), but the crowning of Charlemagne represented the cementing of these developments into their medieval expression, Christendom. I’ll be fascinated to take some time to study the rest of the Noll’s book, as well as other developments in the church during these early medieval centuries. I would especially like to learn more about the Carolingian Renaissance. If you want to learn more about Charlemagne, I recommend reading “Becoming Charlemagne” by Jeff Sypeck. His book covers how the four most powerful empires of the day interacted politically. Those empires were the Frankish Empire, the Islamic Empire, the Byzantine Empire as well as the Papacy. He has a lively writing style and I found his book to be informative as well as entertaining.